This is a book spread done for a Number mingle with our Canada AB Yahoo group. 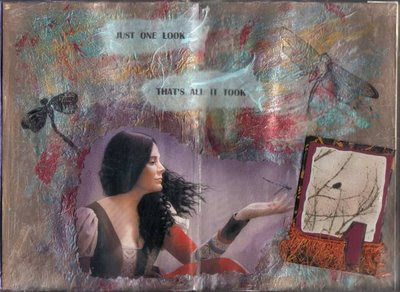 The lovely ATC was made by Kristy. I then used it in my page spread. The background is made with deli paper. Love the vintage look of your work. I really like the light airy look of the background. Delightful eye candy all the way around. Thanks for the link to your blog. Enjoyed checking everything out. I like the softness in your style.....the passport travel pages and the tri-fold are Lovely. I loved that ATC. It just grabbed me.